It’s a little late in the week for a “quote of the week” or “work theme,” but here are today’s words of wisdom as I knuckle down. Actually, that’s good advice every day, every week. “Inspiration” is for amateurs. So get to it, John. Get to it. The count: Yesterday, 652 words, a little behind my goal, but respectable. Bunch of things in the last two weeks – Here’s the best. My eldest son, Jack, sent me two photos on New Year’s Eve. One was of him and his girlfriend, Casey, a picture we’d requested a little while earlier. When decorating for the holidays we’d noticed that our family photos were getting a little dated – we like the older photos, but we didn’t have anything current. The other was this. Somewhere in that gray blur is my first grandchild. Yeah, sometime in August I’m going to become a grandfather. Yippee! What can I say, babies are cute. It seems like a pretty great way to start life. I have friends my age who have been grandparents for 20 years or more. One who is a great grandparent. And that’s been fine for them. Like I said, I never was in a hurry for my kids to reproduce. I want them to get their lives in shape and on track, make sure they’re responsible for themselves before they become responsible for someone else. Well, Jack is 37, a librarian in the Berkeley Public Library System in California. A respected professional and something of an authority on graphic novels and comics – he’s a regular panelist at San Diego Comicon. I think he’s good to go. Tori and I have joked that whichever of our kids became parents first, that’s where we’d move. Well, cost of living in the Bay Area is crazy high, so that’ll take some planning (and perhaps winning the lottery. Or at least selling some movie rights.) But for the short term, it sure changes our travel plans for the year. We’ll definitely be heading to the West Coast in late summer or early fall to meet the little sprat. Can’t wait. In the meantime, I’m working on my new project and I like it a lot. You always do at this stage. It’s when you get about halfway to two-thirds in that things start getting hard. But this is a story with a lot of potential and I’m very excited about it. Tori is arranging a time after school when I can read chapters to a group of students, whose feedback will help shape the story. That’s the same way it worked for “Chrissie Warren: Pirate Hunter” and it was very helpful. I can’t even write the title here yet, because it pretty much gives the whole story. It’s not a pirate story. It’s something different. I want it to be equal parts funny and exciting. It’s a stretch for me, and that’s a good thing. What do you learn if you keep doing the same thing over and over? Sadly, I didn’t get much work done on it that last two weeks. I just finished a 12-day stint of work for my day-job, which is a misnomer since most of it is done at night. Working desk shifts for the Source until 1 or 2 in the morning, then getting up at 6 to get Tori and Max off to school. By the time they’re out the door I’ve been kind of brain dead, so not much writing has been going on. But my colleague is back and I’m on the job again. Looking forward to getting back to the adventure of Connor and Ronnie and their struggle to save their town from an unspeakable horror. My Christmas presents included four books. They all look good, but there was no question which one I was going to dive into first – head first. It was Bruce Springsteen’s memoir, “Born to Run.” In fact, I started reading it as soon as I opened it. I was hooked immediately. My god! The man can write! It’s not a surprise, of course, because he’s written some of the best songs of the last 40 years. But this is so much more – deeply personal, wry, open and often self-deprecating, colorful, sometimes hilarious. The words crackle and dance off the page. I’m still only about 80 pages in, he’s a teenager forming his first band. After teaching himself to play guitar, he started a band and, after their first disastrous gig, his fellow bandmates voted him out. Wouldn’t you love to find those guys now and ask them how they feel about being the guys who fired Bruce Springsteen from his own band? “Writing about yourself is a funny business,” Springsteen says. “But in a project like this, the writer has made one promise, to show the reader his mind. In these pages, I’ve tried to do this.” Oh boy, does he! There are moments so poignant, so steeped in personal triumph and tragedy, longing and regret, that they cut right through the bone and into your soul. As I said, I got four books for Christmas, and I will certainly be reading and enjoying the others. But “Born to Run” is the best book I’ve read in years. Me in my leather coat and felt hat, which now has a new name. The weather was cool as I entered an office building last week, so I was wearing my leather jacket and my black felt hat. As I walked past the lobby desk toward the elevators, the older gentleman at the desk called to me. I wasn’t sure what he said, so I stopped and asked him to repeat himself. “I like your stingy brim!” he said. I still didn’t get it, really. And asked him one more time. I’ve never heard that name, but I like it a lot. And it’s the sort of detail that, as a writer, you want to store away. A character of a certain age in a certain time and place – an older black man in New Orleans – might make a passing reference to “a stingy brim,” adding verisimilitude to a character and scene. Most people, when they see you wearing a felt hat – any felt hat, as opposed to a sports cap – say, “I like your fedora!” That’s because fedora is the only word they know. But it’s only one style. Fedoras have a wide brim (usually turned down in front, up in back) and a pointed or tear-drop-shaped crease in the crown. It’s the go-to hat of film noir. You see Bogart wearing a fedora in “The Maltese Falcon” (one of my favorite movies) and a host of other films. You’ll see it on Richard Widmark and Robert Mitchum in all of those classics. But though the fedora is closely tied to our image of gangsters, the hat Al Pacino wears in the first “Godfather” is NOT a fedora. It’s a Homburg. The Homburg has a narrowed brim (one might call it a “stingy brim.) The crown usually has a crease straight across, from front to back. It’s called a gutter crease. In the mid-20th century, the Homburg was the hat of politicians and statesmen and the upper class. You can see photos of Winston Churchill, Harry Truman, Dean Acheson, Konrad Adenauer and lots of others statesman wearing it. I have two hats, the Homburg and my Panama. They’re my fall/winter hat and my spring summer hat. I particularly love my Homburg. But of course, from now on, it’s my Stingy Brim. 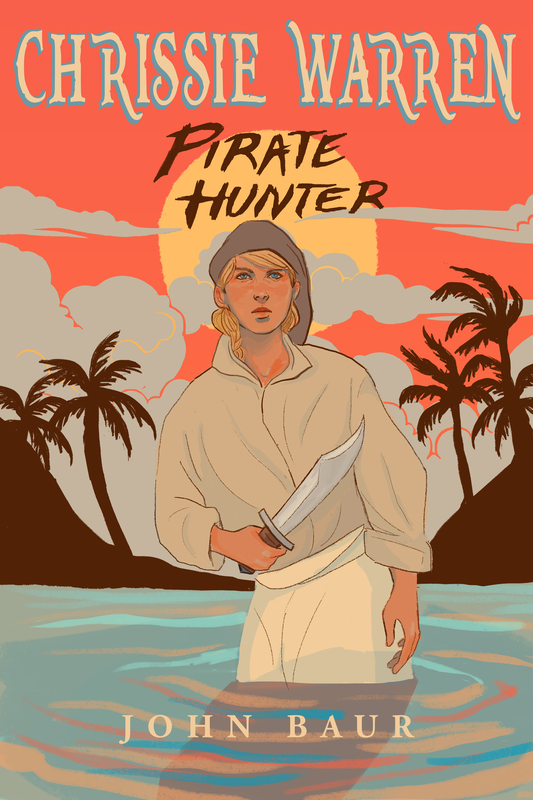 News for my friends on Goodreads: Starting Thursday you have a chance to win a signed copy of “Chrissie Warren: Pirate Hunter.” For the next three weeks Goodreads is hosting a giveaway of four copies of my young-adult adventure pirate adventure novel. As you no doubt know, Goodreads is an online community of more than 20 millions book lovers designed “to help people find and share books they love… [and] to improve the process of reading and learning throughout the world.” It’s sort of like Facebook without cat videos, pictures of your dinner, and all that. If you’re interested and haven’t signed up or just want to check it, you can go to Goodreads.com. And signing up is easy and free. If you’re any kind of a reader, you really want to be a member. One of the things they have at Goodreads is giveaways. With three clicks, Goodreads members can sign up to win books offered by authors. The winners are randomly chosen by Goodreads, so I’ll have nothing to do with choosing. From Nov. 18 to Dec. 8, you can enter to win one of four autographed copies of “Chrissie.” When it goes online I’ll post the link. Here are just a few of the comments readers have given the book. Summer is over. It’s time to get back to work. Sure, for you – for most people in the northern hemisphere – that’s old news. Summer for most people, at least as a state of mind, ends on Labor Day. For me, it’s a different holiday – International Talk Like a Pirate Day, every Sept, 19. I’m not very productive in the summer. I’m just not. (Obviously, the includes blogging.) And the two and a half weeks between Labor Day and Talk Like a Pirate Day I’m even busier. As of the two guys who started the holiday and then took the idea way too far, the buildup is a little like I imagine mid-December would be in Santa’s workshop. Not just getting my own schedule together but dealing with our newsletter – The Poopdeck – and the website and interviews, it all gets a little hectic. It’s slowed down some these days, the holiday has taken on a life of its own. It’s reached critical mass and doesn’t need Cap’n Slappy and Ol’ Chumbucket. It’s reached critical mass. Ten years ago we would do more than 80 interviews in a 36 hour period, radio stations all around the world, starting in Australia and New Zealand and following sunrise around the globe. This year we did a handful, and that’s fine. If something happens to me or Mark, the holiday will go on without us. I’ll talk a little more about this year’s holiday in a later post this week. (No, seriously, this week.) For now, I’m thinking over what I’ve got to get onto. I’ve got to keep pushing on. I’ve got three projects lined up in a row, that I’d like to have cleaned up and ready to go in the next year. One that’ll be finished in ten days, one to complete by Dec. 1, and then one to have finished by summer. It’s all a question of being organized, making a schedule and sticking to it. So far, I’ve got the “making a schedule” part. Now for the “sticking to it” part. This has been a good first week on the road, for a lot of reasons, many of them obvious. But I’m going to give three for now. This is the first time since I’ve known Tori that we have been together without kids for a whole week. We both had children before we met, and after we got married we had three more. (They know what causes that now.) So we have been able to get away for occasional weekends, but that was it. Today is our seventh day on the road, a full week. And we’ve had a great time. Just driving, being silly, exploring new things together, laughing. It’s always been a “given” that she’s my best friend. How fun to see how true that really can be, when it’s just the two of us, how well it works. Speaking of friends, I left Hampton late Sunday afternoon with a slew of new ones, the many fine freebooters I met at the Blackbeard Festival, starting with the members of Blackbeard’s Crew, who were our hosts at throughout the gathering. It was an honor I feel deeply, and I’m proud to call them brothers. Constable Heartless – you’re not fooling anyone with that name. You’re a fine pirate, a fine captain and a fine man. And all the other pirates from the various crews – Hope, Rattanne, Just Gregg, Damon, Mr. Willis, Rummaker, all the crew of the Vigilant, The Moody Crew and the Loose Cannon Company and all the rest of ye – I’m proud to call you brothers – even the women. This had been planned as a sales trip, and certainly that’s the point. We wouldn’t be doing this without the impetus of “Chrissie Warren” Pirate Hunter.” (Certainly as far as the IRS is concerned that’s all it’s about.) It wasn’t necessarily about selling books as getting it out there, meeting people, showing the flag. But it turns out, so far anyway, that we have been selling books, especially the first day of the festival when we sold quite a few. Not just “Chrissie,” although mostly that. But Tori had noticed early in our “retailing” career last year that the tables that seem to do the best have more than one title on them. So we brought with us some of our earlier efforts written with Cap’n Slappy – “A Li’l’ Pirates ABSeas,” “Well Blow Me Down,” and “Pirattitude,” and sold a few of each. In fact, I think it was the single best day of book selling I’ve had since Cap’n Slappy and I had a reading at a bookstore in our hometown and the audience was packed with our longtime friends. This has been total strangers. So we’re hopeful. And, like I’ve always said, each book is sold one copy at a time, person to person, one to one. I actually had quite a bit of fun engaging people as they walked by, joking with them, talking about the books, and drawing them in until – Click! – they decide to buy one. You can actually feel it when they make the decision, sometimes they are as surprised as anyone. It’s fun. We’ve got three readings/events coming up in the next five days, and we are just having fun.